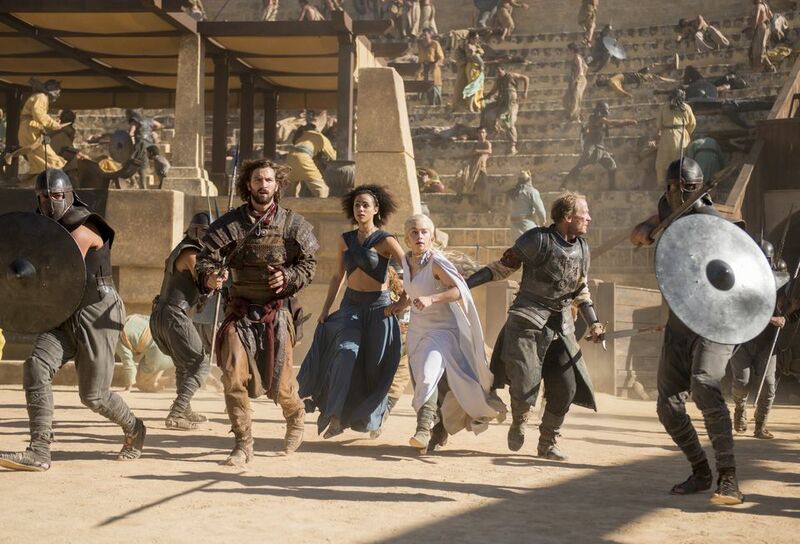 The ninth episode of season five focused on happenings near Winterfell, Castle Black, Dorne, Braavos and Meereen. After an incredible battle at the end of episode eight we were hoping that this penultimate episode would continue the momentum. We weren’t disappointed. The Dance of Dragons was written by showrunners David Benioff & D. B. Weiss with David Nutter in the director’s chair for the first time this season. 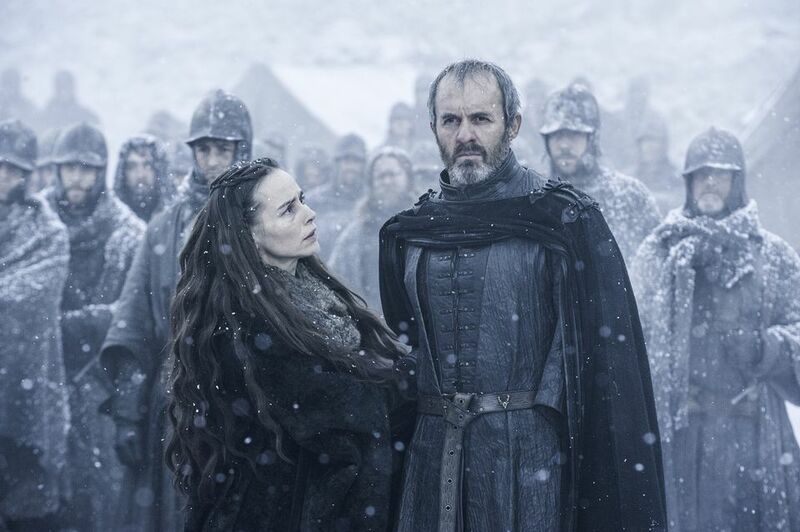 The episode began near Winterfell where Stannis (Stephen Dillane) and his army are dug in while they ride out the winter storm. 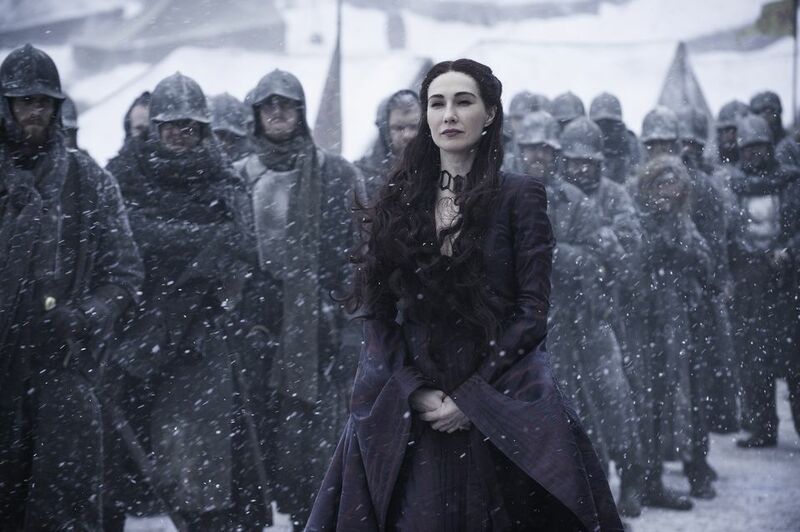 Night has fallen and Melisandre (Carice van Houten) senses that something isn’t right. As she pops out of her tent, lantern in hand, fires break out all across the camp. Ramsay Bolton (Iwan Rheon) has obviously been granted permission by his father to take the small number of men he needed to launch a surprise attack. After the chaos Stannis and his army find themselves down on men, horses, weapons and food. Their situation has gone from bad to worse and the ever concerned Davos (Liam Cunningham) reckons they should pack up and head back to Castle Black. Stannis has different ideas and tells Davos to go to Castle Black himself to request help and to return with men and supplies for their war effort. 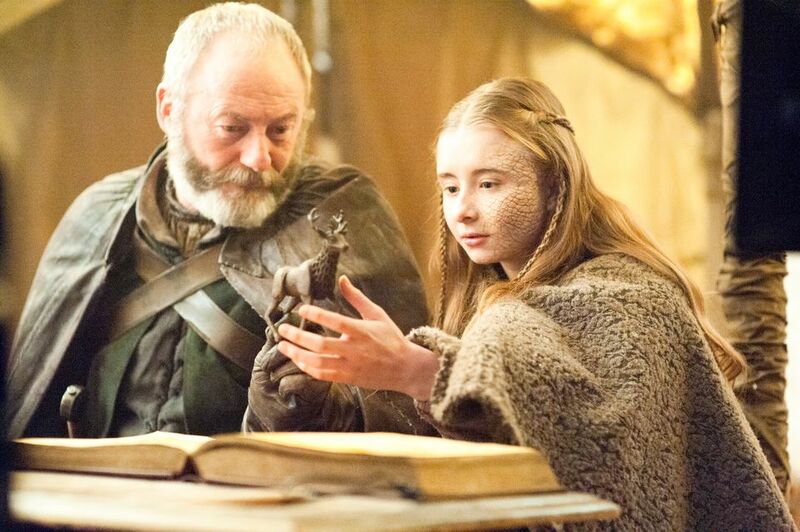 Davos wants to take Shireen Baratheon (Kerry Ingram) with him to keep her safe but Stannis refuses. 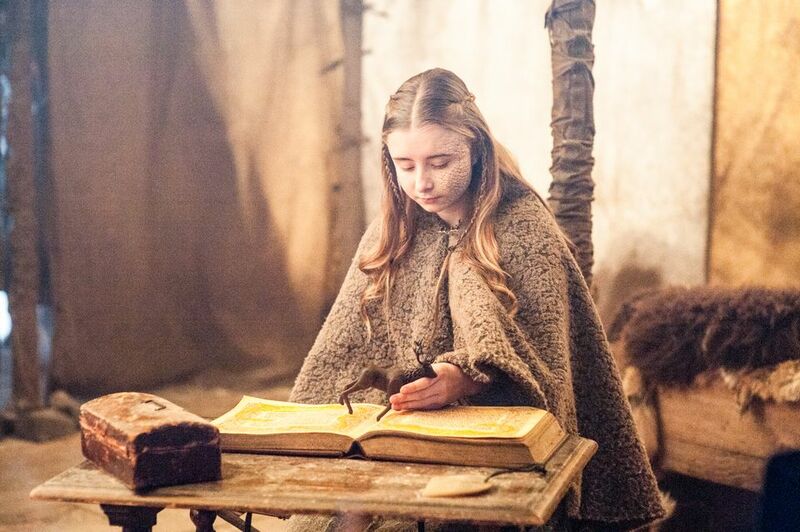 Before he sets out he visits Shireen, who is reading The Dance of Dragons, he gives her a gift of a stag carved out of wood. Sending Davos away seems an odd choice but it soon becomes clear why. Shireen tells her father she wants to help him and he says that there is something she can do. 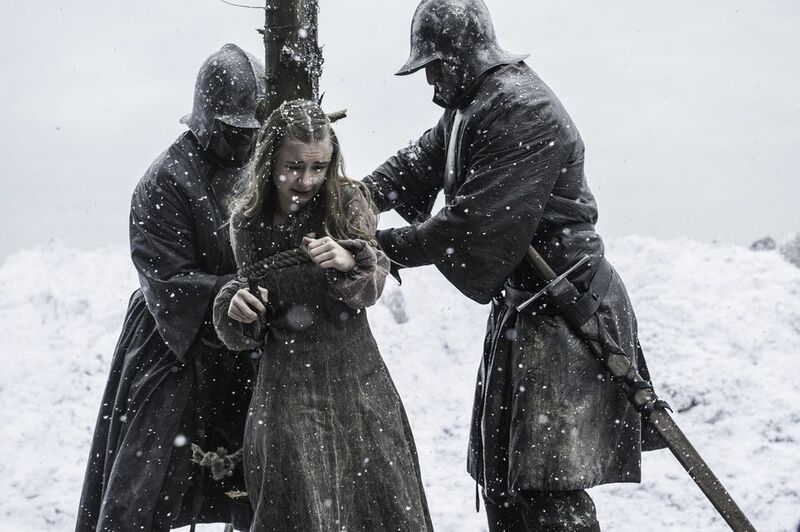 It seems that Stannis is referring to Melisandre’s suggestion of sacrificing his daughter. 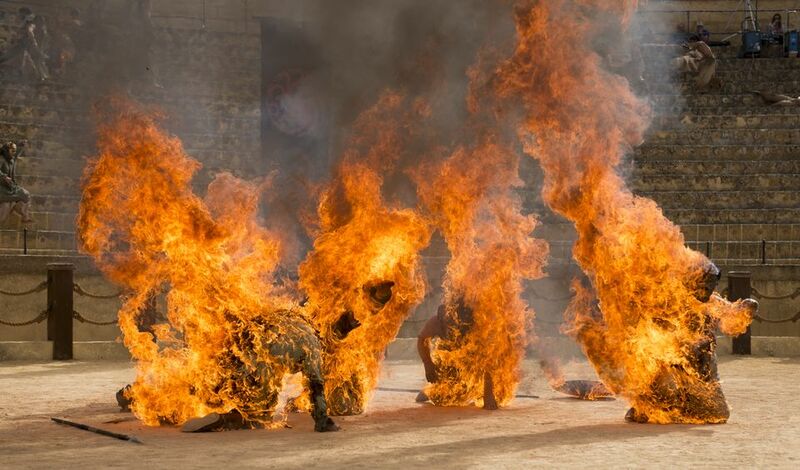 The next scene manages to be one of the most horrendous and uncomfortable scenes to watch as Shireen is tied to a post and burnt alive while we get to listen to her haunting screams. 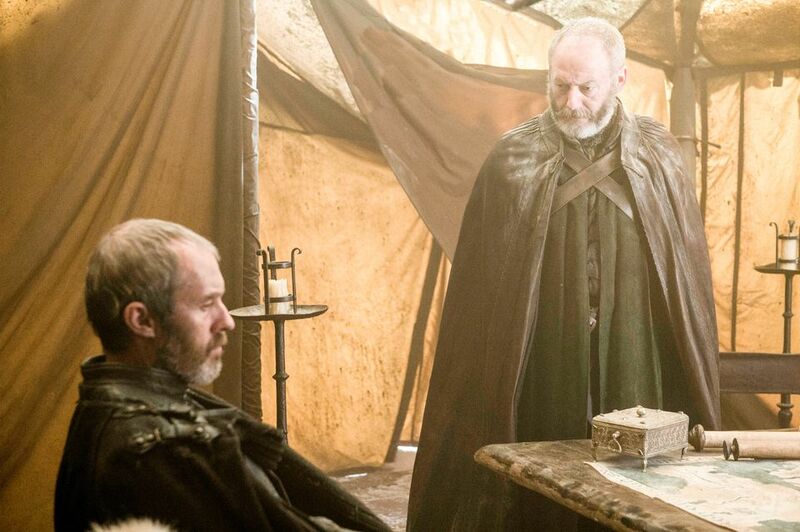 Apparently it’s the only way he can win his fight but Stannis doesn’t look convinced, has he made a huge mistake? At Castle Black, Jon Snow (Kit Harington) returns with Tormund (Kristofer Hivju), the surviving Night’s Watch brothers, a couple of hundred Wildlings and at least one giant. As the party arrive at the wall they stand awaiting the gates to the tunnel to be opened. 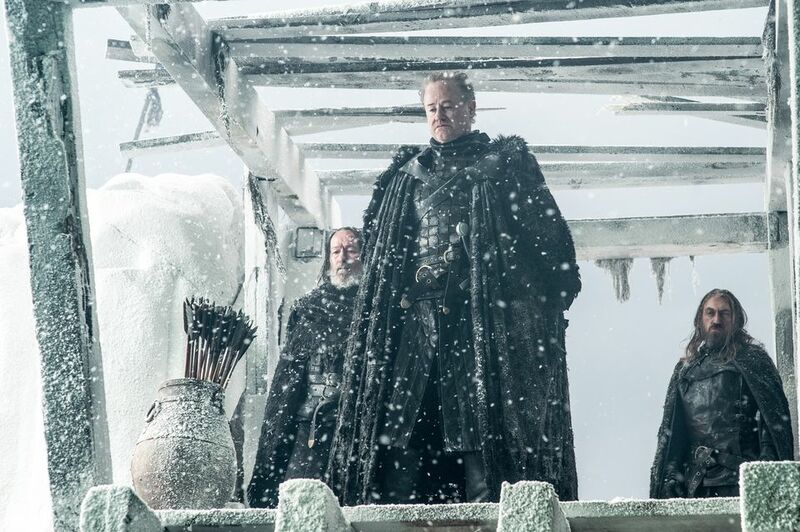 Atop the Wall is Ser Alliser Thorne (Owen Teale) who Jon left in charge. Jon looks worried and for a moment it looks as though Ser Alliser will refuse them entry. A few seconds later he seems to reluctantly change his mind and orders the gates opened. 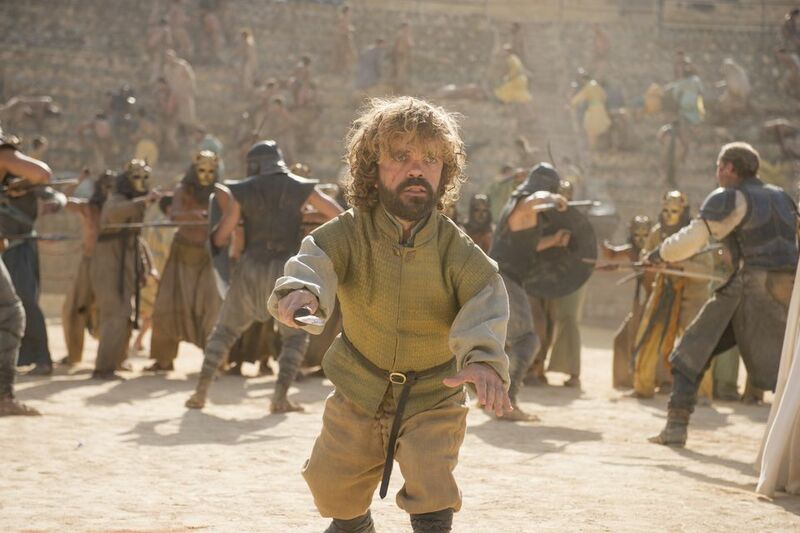 Game of Thrones,Series 5,Episode 9,Dance of Dragons,Sky Atlantic. They peacefully stream through the gates into Castle Black and beyond. 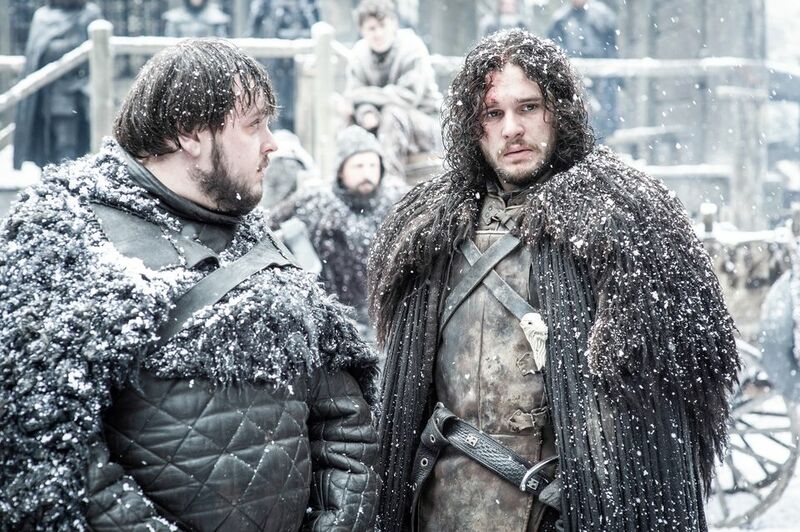 Jon chats to Sam (John Bradley-West) and feels he has failed the people of Hardhome. Ever cheerful Sam tries to point out that those that have returned have all done so because of Jon. Ser Alliser joins them and tells Jon he has a good heart that will get them all killed. 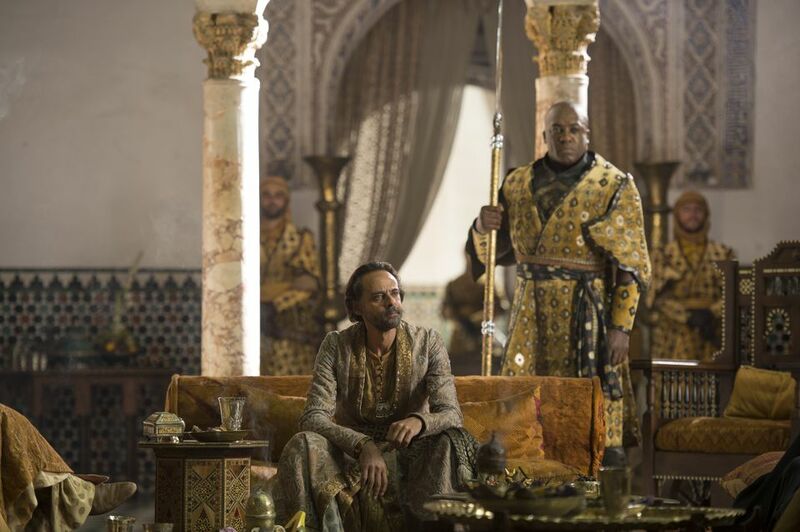 In Dorne, Jaime Lannister (Nikolaj Coster-Waldau) is summoned before Prince Doran Martell (Alexander Siddig). 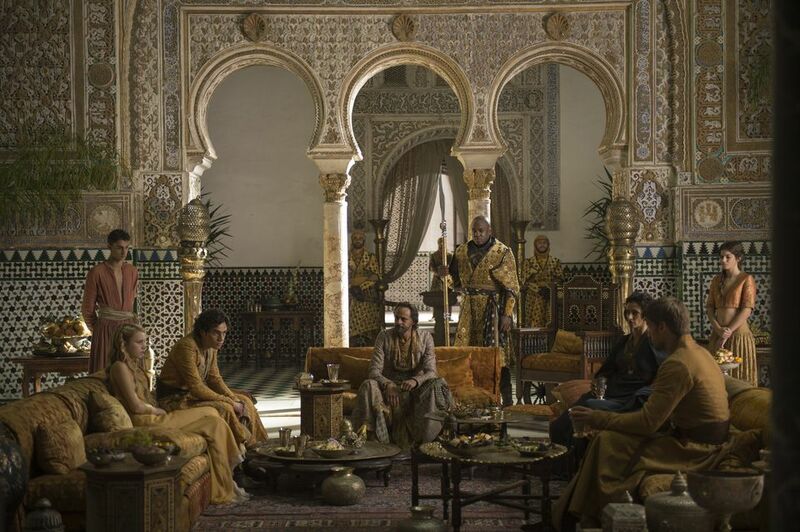 He holds a meeting Jaime, Ellaria Sand (Indira Varma), Myrcella Baratheon (Nell Tiger Free) and Trystane Martell (Toby Sebastian). It turns out that Prince Doran is possibly the nicest most reasonable guy in the whole of Westeros. He believes in mercy and second chances and agrees to let Jaime return to King’s Landing with Myrcella. They agree that the engagement between Myrcella and Trystane will stand and that Trystane will take Oberyn’s place on the council. 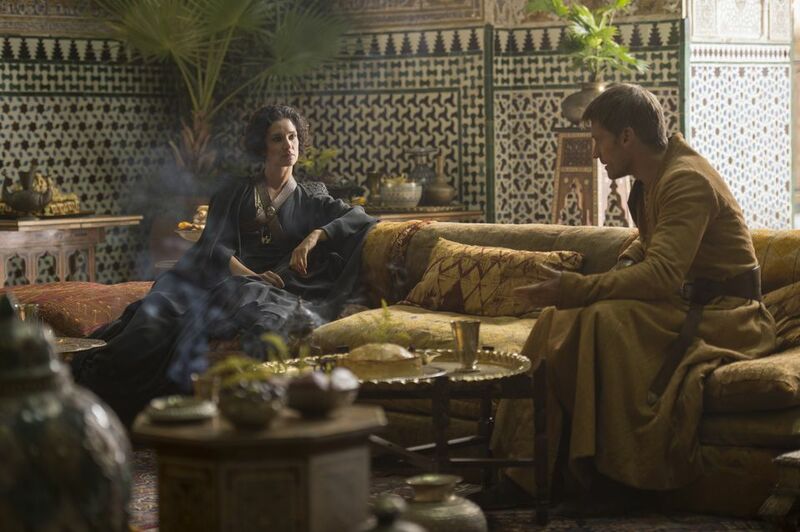 He proposes a drink to King Tommen which makes Ellaria furious and she tips her wine on the floor and storms out. Jaime request that Bronn (Jerome Flynn) be freed and Doran lets Trystane decide. 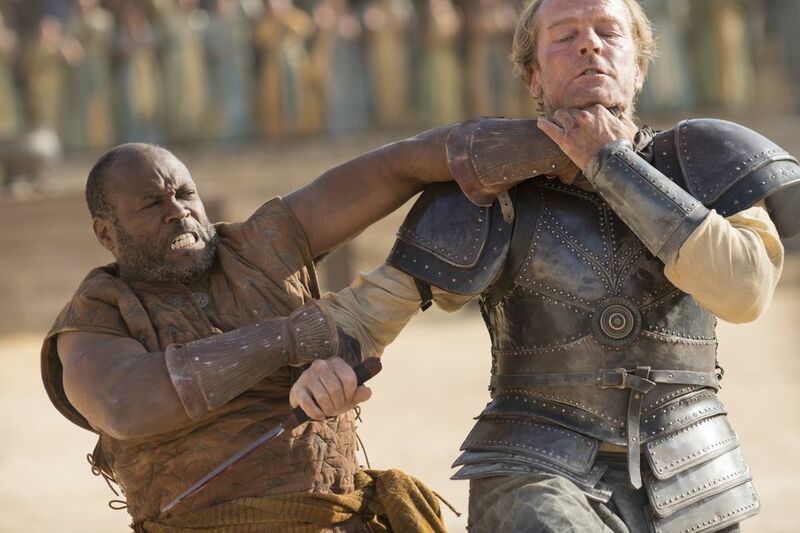 He agrees as long as Bronn gets a smack in the face from Doran’s bodyguard Areo Hotah (DeObia Oparei). 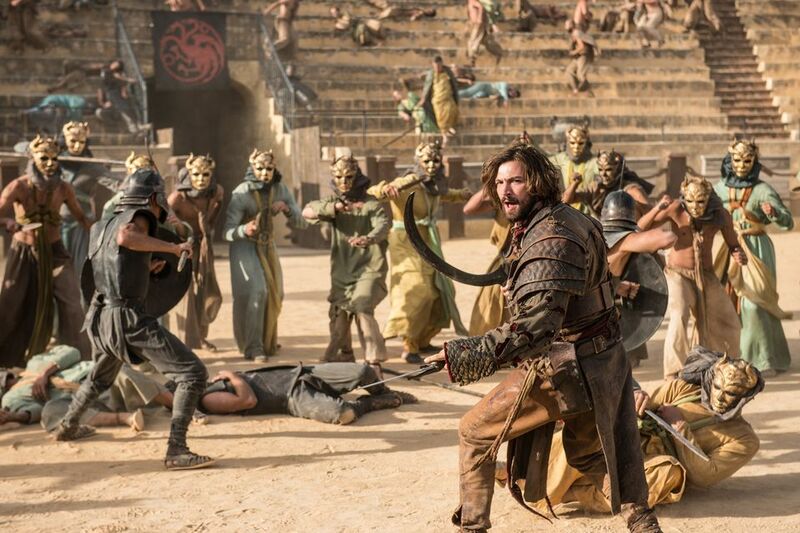 Bronn and the Sand Snakes are released and Bronn gets punched as way of punishment for punching Trystane. Later Prince Doran demands that Ellaria swear her allegiance to him or face death. She agrees and kneels before him before kissing his ring whilst sobbing. The Sand Snakes stand watching and don’t look impressed. 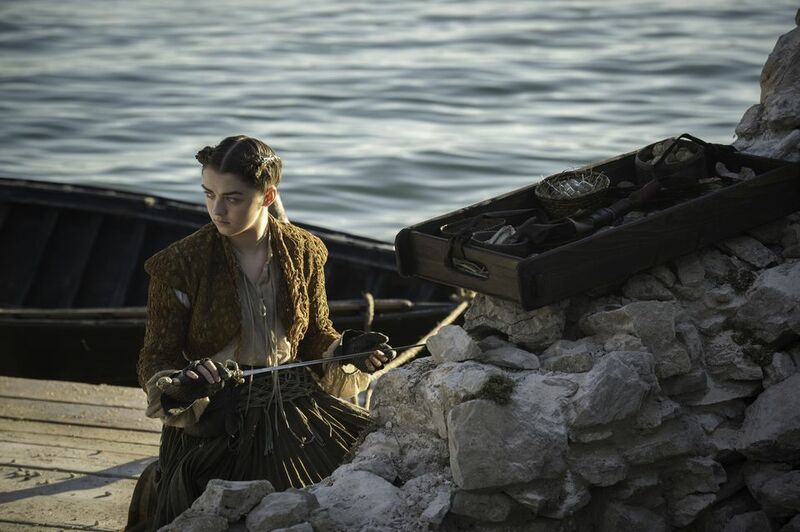 In Braavos, Arya (Maisie Williams) is continuing her assassin training and is about to make an attempt on the gambling man. Before she gets chance she sees a boat arrive carrying Mace Tyrell (Roger Ashton-Griffiths) and Meryn Trant (Ian Beattie). Abandoning her assassination she turns her attention to Trant who is on her kill list. She follows him to a brothel and observes him requesting the youngest girls he can. We have a feeling Arya isn’t going to let him live much longer and hope he gets the horrible death he deserves. Later back at the House of Black and White, Arya is told by Jaqen H’ghar (Tom Wlaschiha) she has more work to do and inquires about her progress. She lies about her day and it looks like Jaqen is aware of what really happened. 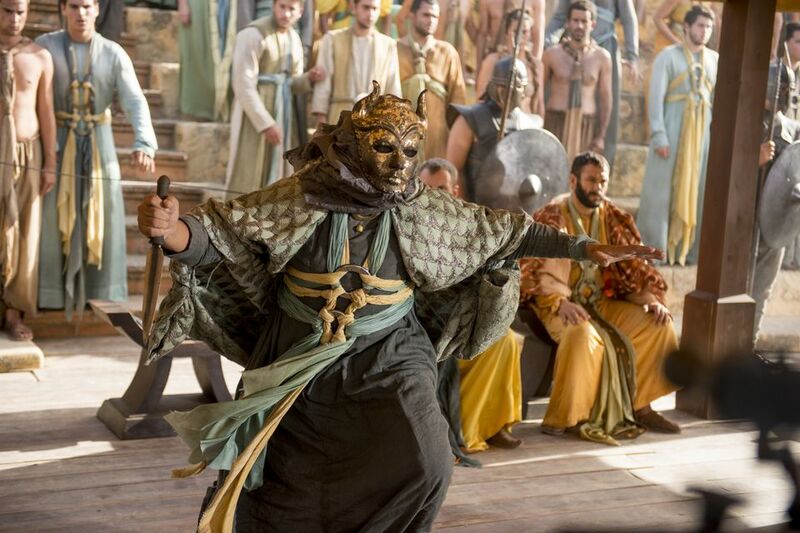 The episode ends across the Narrow Sea in Meereen. It’s time for the Great Games where the best fighters get to murder each other for the enjoyment of everyone watching. 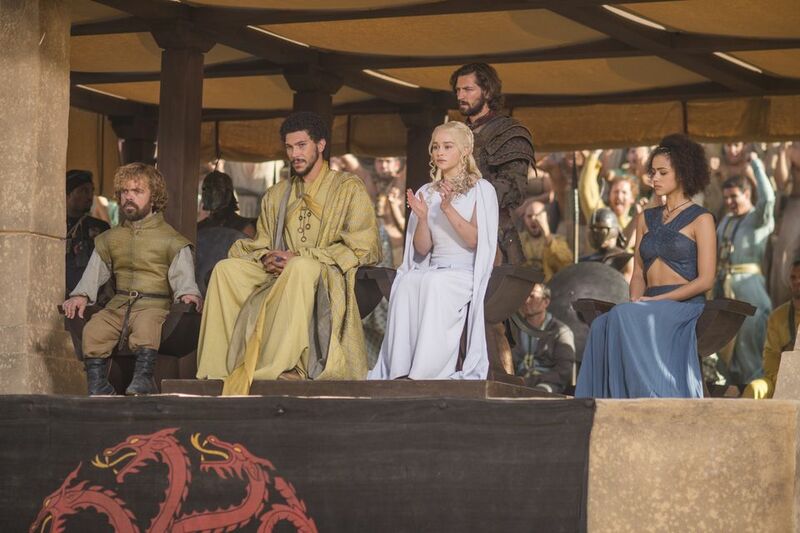 Dany (Emilia Clarke) sits and watches relunctantly with her husband Hizdar zo Loraq (Joel Fry), Daario (Michiel Huisman) and Tyrion Lannister (Peter Dinklage) by her side. Each battle commences only when she gives the signal by clapping. The first battle between two fighters ends as one decapitates the other which sends the crowd into a frenzy. 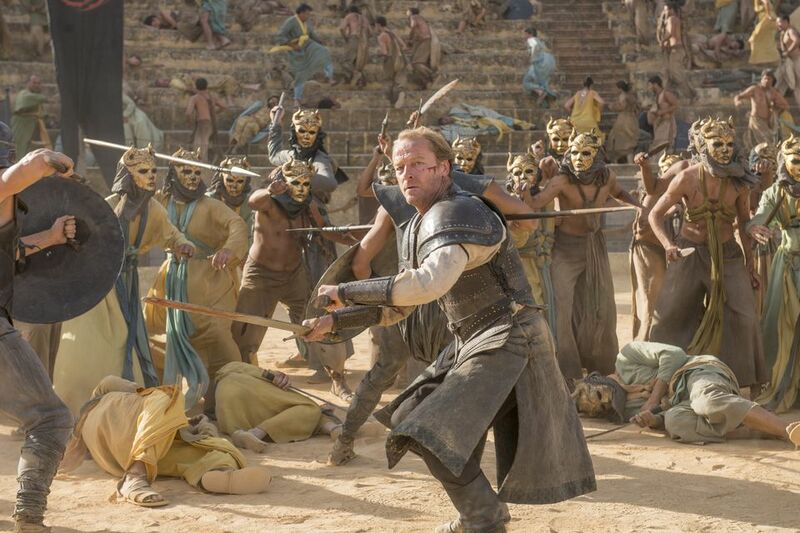 The next battle is between six fighters and includes one heavily armoured guard and Ser Jorah Mormont (Iain Glen). Dany looks cross to see him again so soon but let the fight take place. 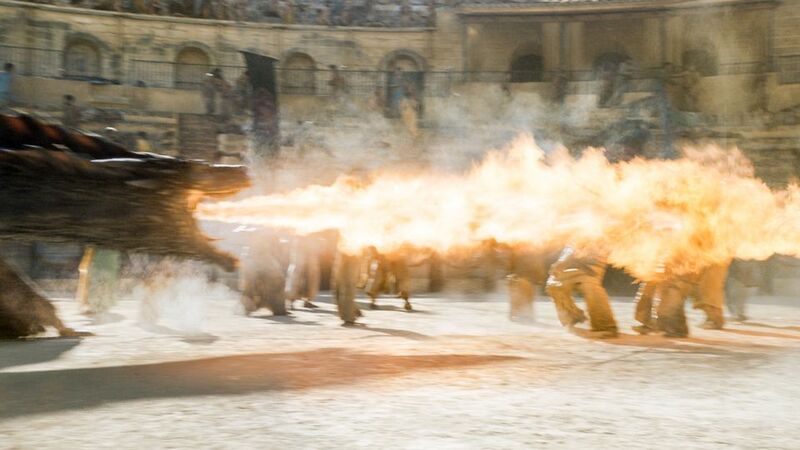 Jorah looks rather rusty but his experience and a little luck see him through as the victor. At the end of the fight he approaches Dany with spear in hand. He looks angry and throws the spear towards her. 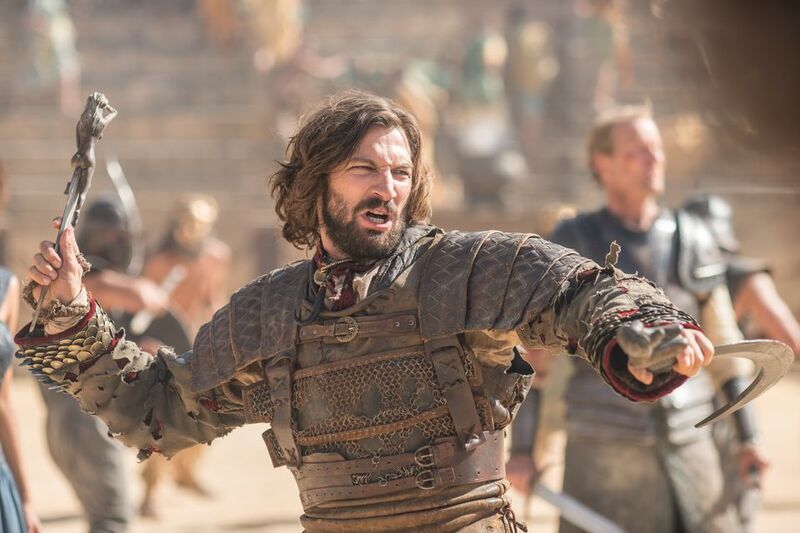 We gasped but were relieved when we realised he was aiming for someone who was to attack Dany. The attacker turns out to be a member of the Sons of the Harpy and is identified as such by his creepy metal mask. Suddenly there are screams from the crowd as members of the Sons of the Harpy appear everywhere and start massacring everyone. 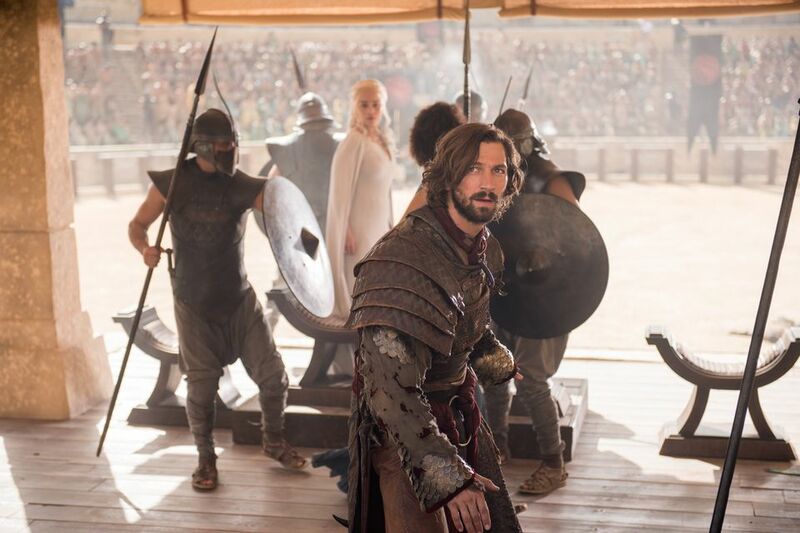 They greatly outnumber Dany and her guards and make for her but are held off by Daario and Jorah. 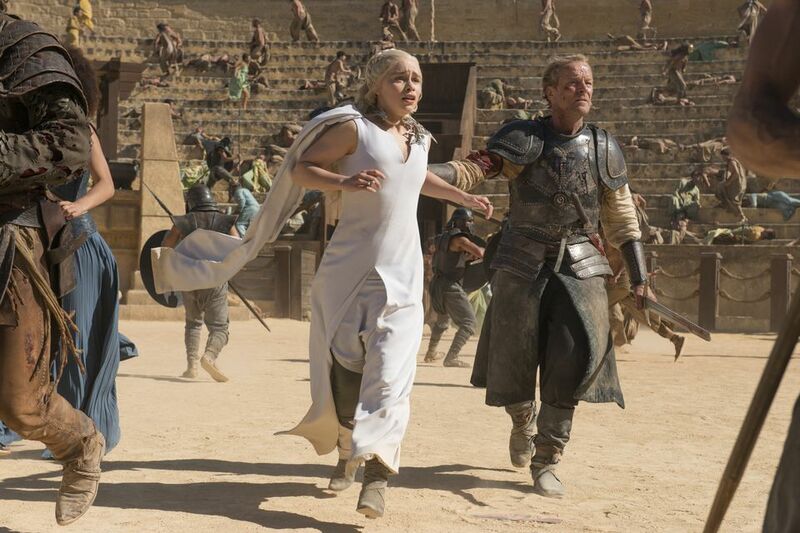 It looks like Jorah might finally be forgiven as he saves her life several times. They all escape down into the main arena but find their exits blocked off. We start to worry again as the group find themselves completely surrounded and outnumbered in the center of the arena. Surely they can’t survive this? 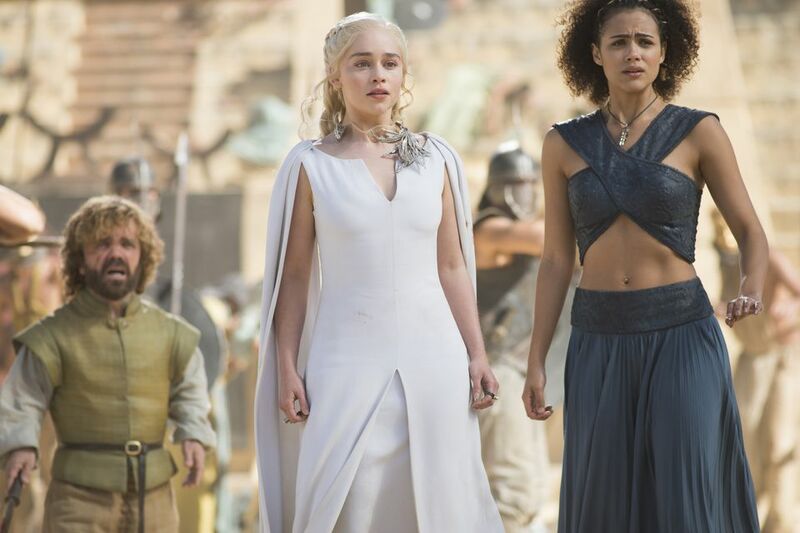 Suddenly we remember that Dany is the Mother of Dragons and wonder if they will come to her aid. It seems she remembers this fact too and shuts her eyes. 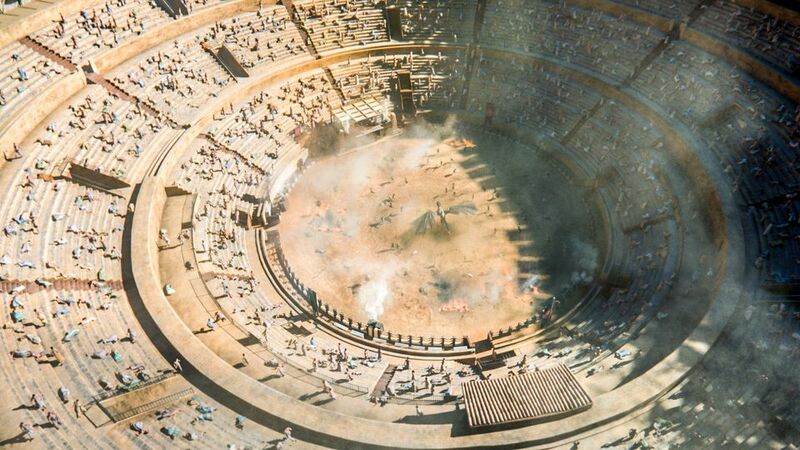 Seconds later the roar of Drogon can be heard as he appears above the arena before dropping down to protect his mother. He makes short work of many of the Sons of the Harpy as they try to retreat. They attempt to fight back and manage to land some spears as he roasts them alive. 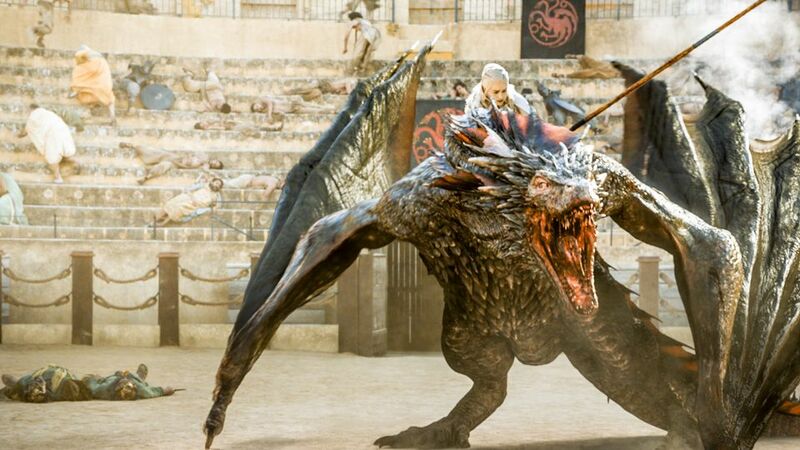 As the tide of battle turns in their favour Dany steps up to Drogon who decides to be less scary for a brief moment. He shows his softer side and true affection for Dany. She helps him by removing the spears and then decides to climb upon his back. 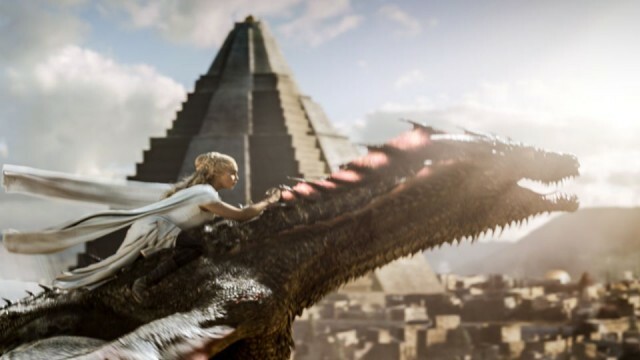 It’s a wonderful scene as she tells Drogon to fly. 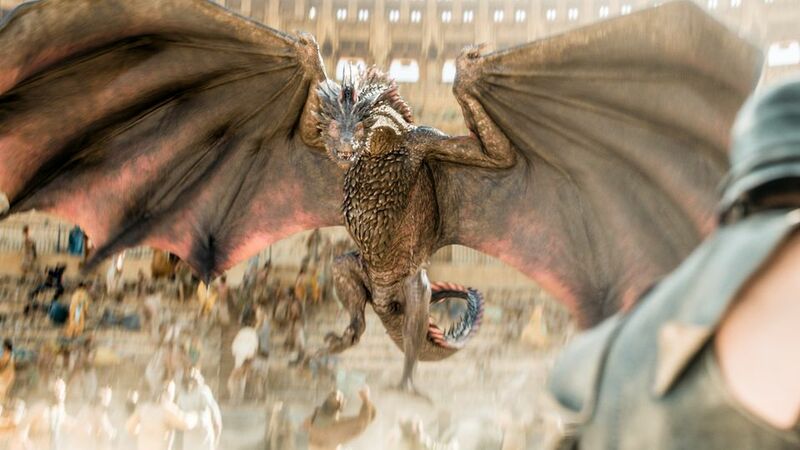 He does and soars high above the arena and off into the distance with Dany aboard his back. Everyone below stands watching in awe. 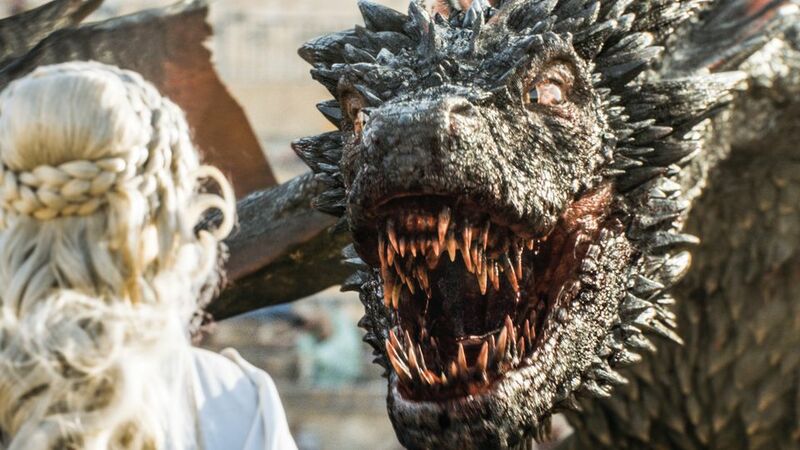 The Dance of Dragons was another incredible episode that sets things up nicely for the season finale. 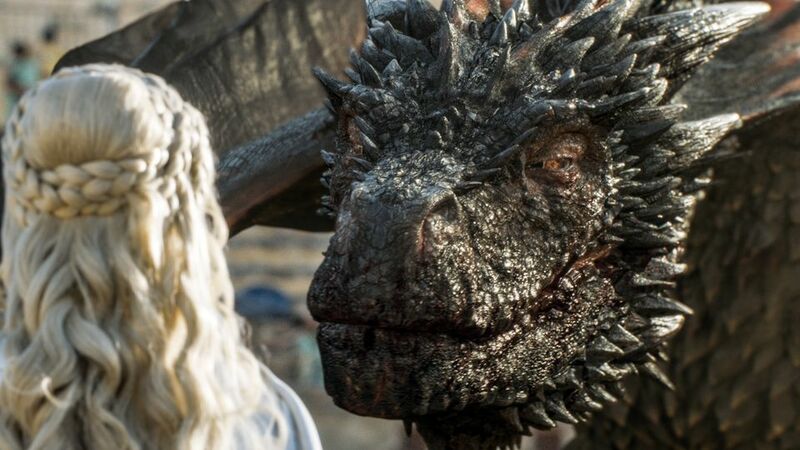 Let us know your thoughts on The Dance of Dragons in the comments below as well as your hopes for the season five finale.